Love this. Is this a pattern? I would probably machine quilt it with clouds. I have a template for clouds and that struck me as a possibility too but I’m such a hopeless machine quilter, I’m not sure. It’s not really a pattern. I based it on a Kaffe pattern that uses 3″, 6″ and 9″ (finished size) squares but I didn’t use the same layout and I changed it several times. I have no idea what would be the best for this lovely coverlet, but no matter what you do, I know it will be lovely. 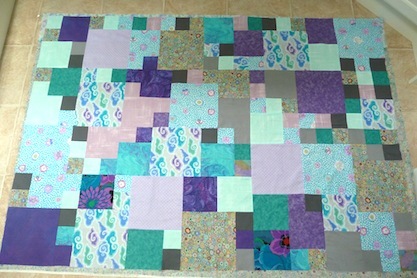 If you have plenty of time, give hand quilting a go, if you are in a hurry, go the machine route. 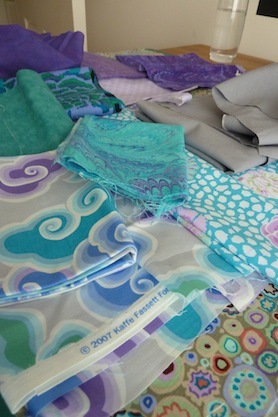 The more you machine quilt, the better you’ll get!! Thanks Linda. I’ll let you know how I go.